China’s slowdown extends further than real estate – other sectors like commodities are slowing too. Over the past 6 months, housing prices have been falling, construction projects slowing, and the real estate market has been tapering off, primarily due to central government policies aimed at cooling the radioactive housing market. But it’s not just the real estate sector that’s seeing the effects of these policies – there are many other sectors and industries affected. As the Wall Street Journal notes, residential real estate accounts for nearly 25 percent of such industries as “construction materials and appliances.” Indeed, raw materials are highly vulnerable to construction downturns. Some analysts have gone so far as to call this slowdown the beginning of the end for the commodities boom. From 2000 to 2010, during China’s major infrastructure expansion, the Financial Times notes that China’s imports of iron ore increased by 42.5 times, thermal coal by 248 times, and copper by 16.2 times. In the same article, Credit Suisse said that China “is the biggest consumer in virtually all commodity categories in the world. China was the key factor behind the global commodity super cycle, in our view.” China also buys 40 percent of the global supply of copper. Decreased demand, due to slowing construction in China, has led prices to slip. Iron ore is expected to be down 9 percent in 2012 from the average price in 2011, and steel prices are expected to fall from $771.8/ton from the end of the first quarter of 2012 to $755/ton by December. Manufacturing has also (arguably) seen a contraction. I say “arguably” because there are two measurements: China’s official Purchasing Managers Index (PMI) and the HSBC/Markit PMI. Both have been on a downward trend since the fall of 2010, but China’s PMI paints a generally more rosy picture. If the PMI is above 50, it indicates improving conditions for manufacturers; if below, it indicates deteriorating conditions. In March, China’s official PMI was 53.1, up from 51 in February, and HSBC’s was 48.3, down from 49.6 in February. According to the Wall Street Journal, the difference can be attributed to the fact that China’s PMI figures focus more on data from large state-owned enterprises, while HSBC’s figures reflect the situation of small and mid-sized businesses, which get much less government support. The National Bureau of Statistics of China, via the WSJ, also reported that the growth of sales in home appliances for the first 11 months of 2011 was 15 percent, compared to 24 percent in 2010, and that furniture sales dipped in the same period, from 34 percent in 2010 to 26 percent. It’s commonsense that falling home prices and less available credit for developers will lead to a slowdown in housing construction, which will in turn cause a slowdown in related sectors. There’s no doubt that China is seeing falling prices and slowing construction, and the numbers seem to indicate that commodities are following. This could have serious consequences for social stability, insofar as it affects employment, one of the most significant factors in social unrest. On the other hand, falling prices could allow more people to buy homes, buoying the appliance and furniture market. There is, of course, a political aspect to this issue. After the leadership transition this autumn and next spring, 70 percent of major policymakers in such bodies as the Politburo will be new to their posts, and the top leadership will be taken over by Xi Jinping and Li Keqiang. It’s quite possible that the new leadership will have its own opinions on managing real estate, though it’s unlikely that there will be significant policy changes. They would be smart, however, to keep Premier Wen Jiabao’s emphasis on building affordable housing. 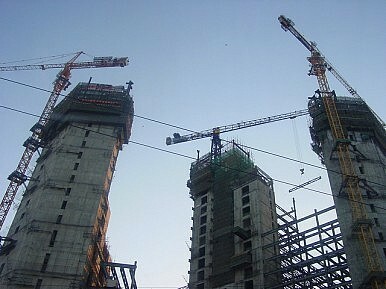 In addition to preventing social unrest, the government’s affordable housing plan, which calls for the construction of 36 million subsidized apartments by the end of 2015, could significantly boost the construction industry and alleviate the squeeze on manufacturing and other related industries. Goodbye Bao Ba China’s Affordable Leap ForwardChina’s Affordable Leap ForwardChina Facing Subprime Crisis?China's Coming Banking Crisis?